Jewish community that lived here. consumed a large section of the Jewish quarter. In the year 1553 Rabbi Israel Isserles obtained permission from king Sigmund the 2nd to build a Synagogue of stone that would also house the yeshiva of Krakow led by his son the Rama –Rabbi Moshe Isserles. Rabbi Yisrael's wife Malka passed away during a plague at that time. The inheritance she left behind provided the funds for this building. The Nusach of the prayers in this Synagogue is the Nusach the Rama Davened –Ashkenaz. transformed by the Germans into a weapons warehouse. Synagogue was once again opened. In the year 1638, The Parnas (Jewish Community Leader) of Kazimierz, Rabbi Eizik R’ Yekel’s (a.k.a. Isaac Yakobovitch), received permission from King Ladislas IV (Władysław IV – 1632-1648), to build the privately owned Synagogue, however due to protests by the heads of the nearby monastery construction was delayed, and the Synagogue was completed in the year 1644, according to the paintings in the Women’s gallery. The “Isaacs’s Shul” was the biggest and most lavishly furnished Synagogue in Kazimierz. It stands on the corner of ul. Yakubah and Izaaka, facing Kupa Street. At the entrance there is an arched doorway, with a double staircase leading to the Women’s gallery. The main prayer hall measures 12 meters by 17 meters (40 feet by 55 feet), and is decorated with many moldings and decorations. About 150 years ago, a new entrance was built on the western side of the building, and in the year 1924 a double staircase was built, the left side leading to another Synagogue – the Mizrachy Synagogue. On the northern side of the building, the administrative offices of the Synagogue were built, also in 1924. During the Second World War, the Synagogue was closed down. Around 25 years ago the main building and the ceiling were renovated, as well as part of the Women’s Gallery and the southern Prayer Hall. The building is under the ownership of the Jewish Community of Krakow, and is used as the local Chabad Center. 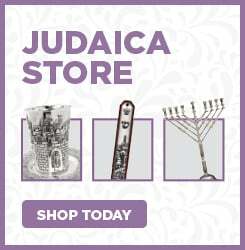 Today there is a Kosher Store running on the premises, as well as a Judaica Store, a large Hebrew/English Jewish Library, Study Hall and Kosher Resturant. 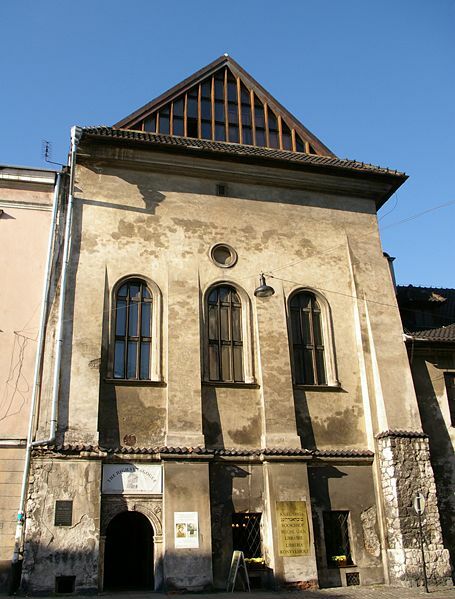 The Old Synagogue is at the southern edge of Szoroka Street, the main street of Jewish Kazimierz. The Synagogue was originally built around 600 years ago, though it was renovated in the year 1556 after a fire. 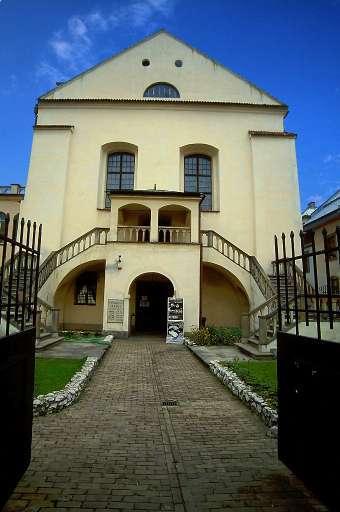 This Synagogue is the oldest Synagogue still standing in Poland. About 250 years ago the Community Center was built right next to the Synagogue, and together they became the Center of Religious and Cultural life for the Jewish community. At the time, the Synagogue was the center of the opposition of the Rabbis of Krakow against the newly formed Chassidish sect that grew in the city. In the year 1786, Rav Hirsh David Halevi –Rabbi of Krakow, and his Bet-Din, issued a Cherem against the Chassidim. Entrance to the Shul is for a fee, except Mondays when it is free. Around the year 1640, the newest of Kazimierz’s “old” Synagogues was built – The Kupah Synagogue, so called because it was built from Community Funds, “Kupah” in Hebrew (in addition t a donation of 400 Gulden from the Jewish Silversmiths in 1643 and another donation from the “Society of Kohanim and Leviyim”). 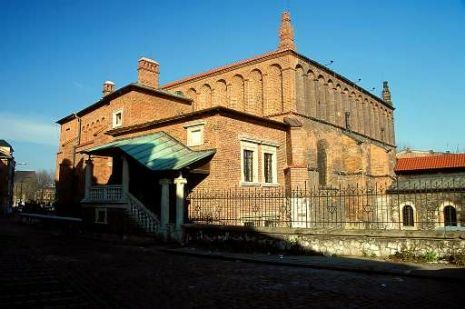 The Synagogue was built between Yakubah Street and Plac Nowy, on grounds set aside for the expansion of the Jewish Quarter, and purchased by the Jewish Community. Originally the Synagogue was totally hidden by the walls of the Jewish Quarter. Then about 300 years ago, the Synagogue wals were raised, and windows added to the northern wall. A women’s gallery was added, with wooden steps leading to it from the exterior. 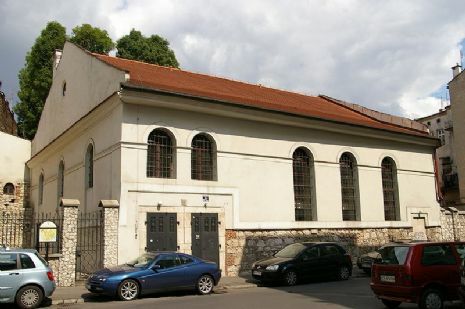 About 180 years ago the Synagogue underwent major renovations; the floor was raised, the small entrance hall was demolished, and a new one built in its place, a new two story building was added with two entrances to the foyer and an entrance from the second floor to the new Women’s Gallery. Two balconies were added to the main Prayer Hall and the outer walls were redone. A bit over 100 years ago, the building to the east was connected to the Synagogue. It underwent renovations to make it fit as a Prayer Hall, and the second floor was refitted as a Women’s gallery, complete with new stairs. In the year 1925 a new iron gate was added on the side facing Warszauera Street, and later in the 30’s a similar gate was built facing Miodowa Street. Also the guard’s hut was renovated and enlarged, the stairs were rebuilt, a new corridor was built and new paintings were added in addition to the old ones which were restored. During the German occupation, the Synagogue was heavily damaged, and many of its Holy Articles disappeared. After the war the building served as a Slaughter-House, a Matzah Factory, and a cooperative of saddle makers. 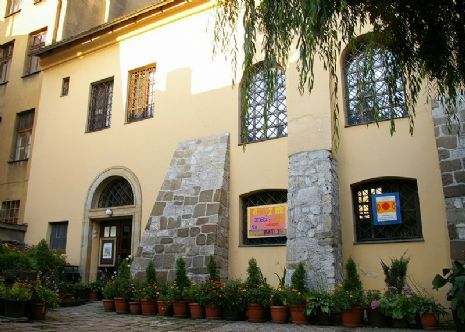 During recent years the building has been renovated, and serves as a galery. It is also an active Synagogue used by local community. On Yozeffa Street, crowded between two apartment houses on the corner of Yozefa and Yakubah, stands the third oldest Synagogue in Kazimimierz. Its rectangular frame, leaning on four supporting pillars, and between them –on the third floor, the three arched windows of the main Prayer-Hall. The Synagogue was probably built in the year 1563, near the home of the wealthy Jew Felix, on the corner of Yozefa and Yakubah. At the time, these streets marked the north and western border of the Jewish City and at that intersection stood the city gate. The “High Synagogue” got its name due to the fact that the Main hall was on the third floor; this was done for security reasons, or probably to remove the main hall from the noisy city gates below. The building’s location; crowded between other buildings, meant that additions could not be built beside it, rather all extensions were added behind it to the north. The building the way it is today is very different from the building used by Kazimierz’s Jews. According to photos and descriptions that survived; the entrance to the Synagogue was perpendicular to the street, through a corridor that took up the western side of the ground floor, then 350 years ago a “L” shaped women’s gallery was built on the third floor. After Felix passed away, his house went to the Synagogue, and finally the Synagogue was able to expand to the sides. During the Nazi occupation the Synagogue was destroyed and all the books and Holy Articles were looted. After the war the building was renovated, and for a few years served the Committee for Antique Restoration. Today the ground floor serves as a Book Store, and the Synagogue serves as a museum. Between the Two World Wars, we know there was a colorful oak door, with engravings of a Lion. Eagle, Leopard and a Deer, on the Ark. This door today is part of the collection of the Jerusalem Museum. During the German occupation, all the Judaica treasures were stolen, and the building stopped serving as a Synagogue. In 1965 the building was renovated, and is now being used as a Jewish Culture Center. The cemetery is at the end of Miodowa Street, 3 minute walk from Szoroka. 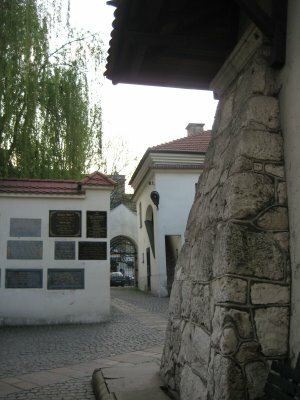 Many of the famous persona who lived in Krakow are buried here; the Ba’al Maor Vashemesh, R’ Shimon Sofer and his son-in-law R’ Akivah Kurnitser, R’ Yosef Nechemyah Kurnitser and his son R’ Shmuel Shmelke Kurnitser. Near the entrance is the building of the Chevrah Kadishah.